When was the last time you had some Cracker Jack? For me, it’s been over 10 years or more… but after reading about this contest, I’m thinking about buying some! Cracker Jack has hidden a very special prize in some of it’s boxes. Instead of the usual kid’s temporary tattoo or plastic toy, some people will surprised when they are rewarded with an actual diamond ring. Cracker Jack’s promotion, which is with participating Walgreens, will probably remind some of getting Willy Wonka’s Golden Ticket. 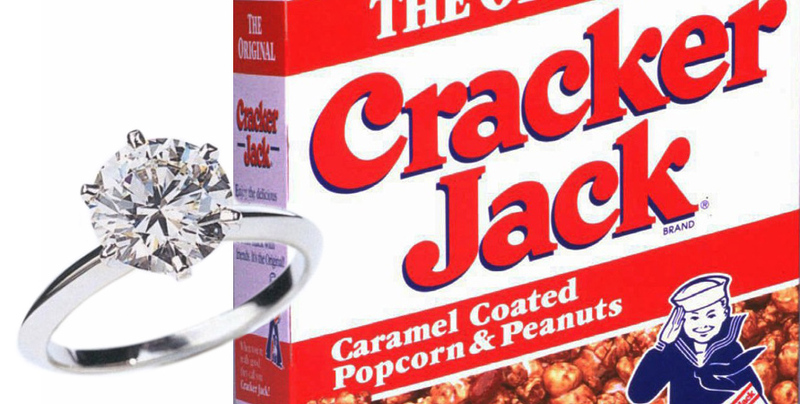 The Cracker Jack prize may not offer a lifetime supply of chocolate and some Oompa Loompas, but it does offer a sparkly diamond ring valued at $1000. This Cracker Jack contest was made to celebrate the 100th anniversary of the company. Cracker Jack is known for its “prize in every box” that was first introduced in 1912. Their contest runs through the end of February. This entry was posted in Contests and tagged contest, contests, cracker jack, diamonds, prize, prizes, win a diamond ring, winning. Bookmark the permalink.